Grocery shopping is usually a simple task. You go to the store, get a trolley, fill it up with things you need (and sometimes things you don’t need), stand in line, check out, and drive your stuff home. Bam! Done. Not in Gush Etzion these days. A successful grocery store chain, known for its competitive prices, just opened a large store (with good-quality produce, meat counter, cheese counter, and small bakery counter) at Tzomet HaGush (Gush Etzion Junction). While the new Rami Levi is the answer to many bargain shoppers’ prayers, it has opened up a large can of socio-political worms as well. There are people who are thrilled to have a new grocery store in the area. Most people in the Gush have large families (four kids is usually a starter kit here), and it’s not always pleasant or convenient to contend with the occasionally long lines at the checkpoint to the tunnel road, and then crazy Jerusalem traffic, in order to do a big shop in Jerusalem. Sure, the stores there are big, and Talpiot, an easily accessible industrial area in the southern part of the city, has a wide variety of grocery stores including several Rami Levis, two Supersol Deals, a Mega, some great paper goods stores, and a few smaller markets that carry lots of American products. In Efrat, on the other hand, there are two small grocery stores that have so-so produce, small meat counters, and high prices, and a couple of makolot (quickie marts) that also stock basic necessities. These local places, usually owned and run by local people, have higher prices than the large supermarkets. Their overhead is high, it may be expensive to have small amounts of stuff trucked out past the Green Line, and turnover isn’t very high. But some people remain loyal to the locally owned places, doing smaller shopping runs there to try to keep them in business, while saving their bigger shopping trips for the larger chain stores in Jerusalem. And now there’s this new Rami Levi. Prices on most things are lower than in the local stores, though in some cases higher than at the Jerusalem stores. But the store is clean, has wider aisles than the local shops, stocks most of what the Crunch family needs, and is much closer than Jerusalem (saving gas, time, and hassle). And like most of the big grocery stores in Jerusalem, it employs both Arab and Jewish workers. This last factor may surprise some people. Those who think Israel is an apartheid state might be surprised to learn that Arabs and Jews shop in the same stores, and that the stocking and butcher staff are Arab men, while the cashiers and cheese counter workers are Jewish women. (There are also Jewish men who work in the stores, though I have yet to see an Arab woman employee.) This looks cosmopolitan, pro-peace, and politically correct. A further concern is the survival of local businesses. Last week, a flyer was placed in Efrat residents’ mailboxes. 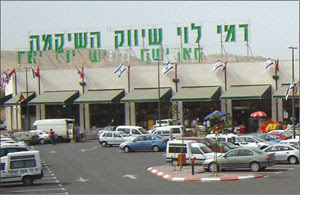 On the Chief Rabbi’s letterhead, Rav Shlomo Riskin encouraged Efrat residents to continue to shop in Efrat’s local stores. This is to keep locally owned businesses afloat, but it does more than that. In the flurry of remarks posted to Efrat’s chat list, one person pointed out that the local store owners offers delivery service which enables the elderly and those without cars to shop easily. Our local, family-owned makolet allows customers to open a store account, enabling you to your kid there to pick up a dozen eggs or a box of macaroni and cheese, and they’ll put it on your tab so your kid doesn’t have to handle (or lose, or misspend) cash. One person reported that one of the local stores allowed a needy family a year to pay its grocery bill in full. There are some benefits one can only get from small, privately owned markets. But there is a further concern. People who work together also take breaks together. And taking breaks together allows people to get to know each other socially. One by-product of having Arab men and Jewish women working together has been the occasional intermarriage. Now, before anyone flies off the handle and starts flinging the race card at me, hear me out. This is not a simple Us versus Them issue. This is not a Jewish extension of the Cult of White Southern Womanhood. This is a serious, heavily-charged cultural conflict and has to be looked at from all angles to be understood properly. I’m usually a proponent of the free marketplace. Having lived for years in America as an Orthodox Jew, I found ways to function in wider secular and Christian society without losing my commitment to kashrut, Shabbat observance, and the values I hold dear. My version of the Torah can stand up to any comparison, and my fear of assimilation for myself and my family was low. But I come from a privileged background, educated, comfortably off, part of a family and wider community that is caring and supportive. Not every woman has that in her life. Jewish women working in grocery stores are often women who belong to a more vulnerable population—from poor families, immigrants, not doing the things girls with more advantages usually do after finishing school such as the army, seminary, national service, or attending university. If they’ve grown up sheltered from the wider world, they may not be aware of the mores and customs of people from other cultures. If they have a tenuous relationship with Judaism, or with their parents, they may find themselves inclined to rebel against what they’ve grown up with, and see a relationship with or marriage to an Arab man as a good way to act on that rebelliousness. A woman put into a situation with maximum contact with people of another culture and inadequate preparation for it are women put at risk. While some, including Rami Levi himself, may see bringing Jews and Arabs together in the workplace as inevitable and even desirable, there are externalities in this situation that are either being ignored or downplayed. While it is possible that some women who marry Muslim men and go to live with them in their Arab villages live happily ever after, there are scores who do not. The expectations heaped on Arab women who marry Arab men in terms of domestic skills, child-bearing, and humility to those above her in social status (including husband, mother-in-law, and all other men) are high enough. Add to those the socially acceptable practice of wife-beating, lack of human rights women have in traditional Muslim society, and any disdain or hostility aimed at an outsider joining that world, and what was supposed to be a happy life can become a living hell. Two organizations, Yad L’Achim and Lev L’Achim, work to combat intermarriage and assimilation, rescuing Jewish women and their children from Muslim husbands who, after promising the love, attention, and comfortable home many of these Jewish women crave, deliver something quite different. Cries for Rami Levi only to employ Jewish workers will go unheeded. He always hires both Jews and Arabs, thinks it’s a good thing for Israeli society, and saves money by paying the Arabs lower wages (which still trump anything they can make in their own business sector). And to suggest that Jewish women not work for a Jewish-owned business is also absurd. So what’s the solution? That’s up to everyone to decide for themselves. Some will refuse to shop there out of safety concerns, to protest against the competition to local businesses, or out of disapproval for the societal risks involved in Jews and Arabs working together. Others will see that the store here is not qualitatively different from the stores where they would normally shop in Jerusalem, and take advantage of its proximity and convenience. I remember heated discussions taking place back in Newton about the various markets. Should one buy meat from the prime butcher despite his very high prices in order to support a local business? Should one buy challah that tastes like sawdust and clearly contains yellow dye #6 from the local baker for the same reason? Should one buy one’s kosher meat at Costco, thereby threatening the survival of the kosher grocery store? Is it ethical to pay 40 cents less for a block of Tillamook cheddar cheese at the Trader Joe’s, supporting a non-Jewish chain of stores over the Jewish-owned store on the Jewish main drag? The difference seems to be the survival of local Jewish businesses versus the survival of the Jewish people. The absolute essence of Judaism is community – living with each other, supporting each other, laughing and crying together. Without other people to share our lives with, there is no Judaism. Those who can afford to shop at their local Jewish-owned markets should do so. Those who aren’t as well off should shop at places whose prices don’t make them even needier. As Jews, we do the right things for ourselves by doing right by everyone else. I try to balance my shopping between local shops and big stores but it is hard to advise otherwise someone who cannot afford small stores. If a work break can lead to intermarriage, a stop at a petrol station would do the trick too! It seems better to foster a strong Jewish identity than forbid people to work with non-Jews (whatever the country). Sol: As you point out, shopping decisions often have to be made with economic concerns at the fore. Ilana-Davita: I don’t believe that one gets to know the pump boys at the gas station as well as one’s own co-workers. But I agree that every family must give its children a strong identity and prepare them for the outside world. My discomfort with the idea of regulating who can work where because of intermarriage concerns stems from fear of Big Brother-dom in the workplace. I don’t like to hear of Jewish women trapped in marriages where their lives are at stake if they try to leave, but I still don’t feel comfortable with trying to control people’s personal lives in the public sphere. I know my statement was a bit exaggerated but what I meant is that meetings between people do happen, sometimes in the most incredible places and that unless people are comfortable with their identity intermarriages can take place.